Yes, you did in fact read that correctly. Our family no longer celebrates Christmas or any pagan holiday for that matter and this series of posts will explain why. No, we have not become Seventh Day Adventist, Jehovah Witness or any other religion that we typically think of that does not celebrate holidays. We are still what the world would call Protestant Christian, but as we are learning we prefer to drop the titles and just say we are simply followers of Messiah (Jesus), the Savior and Redeemer of the world. We are in search of the pure gospel found in the Scriptures, not defiled by the evil one and/or man and aim to pattern our life after the example left by the apostles and the New Testament church. So, hold on to your hats and if you really are in search of the truth and desire to worship Elohim the way He commands us to, you will take the time to read all that will be shared here about the holiday known as Christmas. You will find what I have learned from research/study and what Elohim has to say about it through His Word. This post will be written in 3 parts as there is so much information to share and it’s not an easy read, friends. This is the kind of truth that takes a while to really sink in, so I want to give you time to read and then to PRAY. I also ask for you to be a Berean and please do your own research, do not take my word for the information I present here…but dig for it yourself. Sometimes, that is what it takes for the Holy Spirit to open one’s eyes….the willingness of the person to be open to something other than what they know. Digging for the truth on your own, is simply part of the process to being open and teachable to what the Holy Spirit would have to show you. I am praying for each of you that will read this for eye salve to see and know the truth! Before I break down each reason why Christmas is not a ‘Christian’ holiday and has nothing do to with the birth of our Messiah with historical facts and scripture, let me give you a brief summary of those points here in Part I. What is Christmas really about anyway, is it to worship Messiah or is it to satisfy the flesh? So, let’s take them one at a time to understand how we have been deceived by the evil one as this holiday has nothing to do with worshiping our King. Messiah was not born on December 25th or even in the winter, but in the Fall. From the few clues we have in the Bible from the story of Messiah’s birth we see that the shepherds were abiding in the field keeping watch over their sheep. It was custom among the Jews to send their sheep out to the desserts around Passover (early spring) and bring them home at the beginning of the first rain which began early to mid-fall. During this time the shepherds would keep watch over them, typically bringing them home sometime in October. This puts the birth of Messiah not in December, but presumably sometime in September. Without going into deep detail about the Jewish calendar and customs, we can know from the account in Luke 1:23-24 John the Baptist was conceived shortly after his father Zacharias came home from the temple serving during the 10th week for the third Sabbath of the month of Sivan (May/June). We also know from Luke 1 that Elizabeth conceived John 6 months before Messiah was conceived. This puts John being born sometime around March of the next year (9 month time period) so Messiah would have been born 6 months later in September, not December. We also know by studying prophecy (included in another post) that Messiah was born during the feast of tabernacles (during Sept/Oct), as the Word became flesh and dwelt or tabernacled among us as we find in John 1:14. There is much more detailed research on the timing of Messiah’s birth if you wish to dig for it. I am simply presenting a high level overview of the points most commonly understood. Below is a quote from Charles Spurgeon from 1871 on December 24th regarding ‘Christ-Mass’. 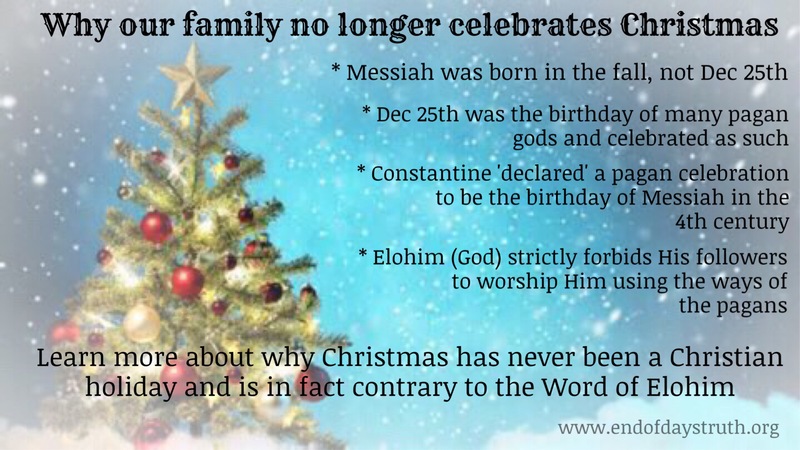 If that doesn’t speak volumes as to how we should view the day Christians call Christmas, as a superstition because there was simply no divine authority to celebrate it. If Elohim, the creator of the universe thought it important to celebrate the birth of His son, our Savior, don’t you think He would have made sure to tell us exactly when and detailed instructions on how to celebrate? The Father was clear in Leviticus 23 when He gave instructions for His appointed times (Festivals/Feasts) that were to be observed and still should be today, as we are waiting for Messiah to fulfill the fall feasts at His return. Elohim Himself appointed His Holy Days. He did not leave this up to the authorization of man. Yes, we have liberty in Messiah with issues where scripture is silent but we do not however, have liberty to create our own feasts and/or Holidays (‘Holy Days’) as if we were the Creator, Elohim Himself. In our family, we look to the New Testament church as our guide as from that point forward the sinfulness of man, used by the enemy has gotten in the way and the pure gospel has been polluted. So, the question for us is…did the New Testament church institute or observe the celebration or ‘Holy Day’ Christians call Christmas? No! The corrupt/pagan/Babylonian Roman Catholic church did in the 4th century. To observe a man-made holiday which is said in Christianity to worship our Savior by pointing to His birth, without the authority from The Father is an attack on the sufficiency of His word.. The sufficiency of Christ and His Word to rule us in matters of faith and worship is at stake if we celebrate Christmas. To celebrate Christmas is to directly attack the sufficiency of Christ and His Word. It is to make ourselves wiser than God. Instead, we should remember and reflect on the death of our Messiah in which we receive our redemption through His perfect blood that was shed. Our Savior is our spotless Passover lamb and He was crucified on Passover as we find in the four gospels. This is a time when we should honor our King and observe by example of Messiah, taking the bread as a symbol of His body and the cup, a symbol of His blood in remembrance of Him and what was about to take place over the course of the coming hours. We are reminded to do so by Paul in 1 Corinthians 11:23-26 and to observe this last Passover supper of our Master until He returns. I hope you are beginning to clearly see from the historical evidence and truth of Elohim’s Word, it’s not looking too favorable for the observance of the day Christianity has deemed the birthday of Christ. This entry was posted in Uncategorized on November 13, 2015 by Misty. Shalom Am Yisra’el. Excellent article on the truth of our Creator, יהוה .I’ve used this article and the meme to share to others. However, the Body of Messiah must continue to pray for all to come to repentance and seek HIS righteousness in HIS truth. Shalom.